It’s here, it’s here!! The new Distress Ink Color of the month is a very festive red for the month of December!! Candied Apple!! I love it..and can just see adding some Glossy Accents to it, as well as the infinite Valentines possibilities! The preorder bundle will be in the store this afternoon, i assume it will ship around the 18th. Newly added to the store these tags are made of premium card stock, washy tape, glitter tape and hand punched, finished with the silver string. Each set of eight comes packaged in a cellophane bag and will be shipped in a padded envelope. Only two more weeks until Cyber Monday! Only two more weeks until Cyber Monday, the biggest holiday online shopping day of the year! Last’s weeks early bird sale was fun, shall we do it again? How about 15%? Just use code CYBMON15 at our Scott’s Marketplace Store and save!! It’s not too early to start saving. Save 10% on all products in our Scott’s Marketplace store! Just use code CYBERSALE10, when checking out. The new color of the month has been announced by Ranger. It is Lucky Clover, a beautiful green. Tim just perioscoped and showed how it compares to Mowed Lawn and Evergreen Bough and it’s definitely different!! We’ve got a bundle up in our Scott’s Marketplace store and they are available for preorder, shipping Monday, November 23rd. Our holiday items on order from Lawn Fawn have arrived and the pre-orders are going out today! You should all have your tracking info by now. While there are just a few items showing in the store, we’re happy to order anything from the August release (or any current lawn Fawn product for you) and match prices for our currently stocked categories. If you don’t see what you’re looking for, just give us an email and we’ll be happy to set up an order for you! August Distress Ink Color of the Month – Ground Espresso. as well as the distress ink pad. Will be adding the rest shortly, these will ship starting August 18th. June 15th – July 6th. Please email us if you would like to schedule something outside that time period! 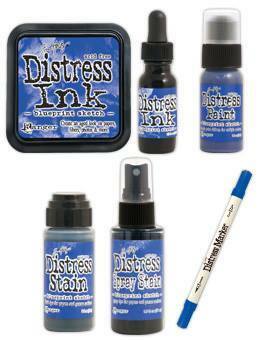 The Distress Ink Blue Print Sketch bundle is on sale for $24.00 Get it through Tuesday, July 14th. If you would like to reserve this item now, you may purchase it now with the rest of your order. We will hold your order now and ship your entire order as soon as this item is back into stock. If you would like your order to ship now, please place this item on a separate order. This bundle includes the distress marker, distress ink pad, distress reinker, distress stain, distress paint.